May 2013 – Hans Christian Andersen has undergone a major refit and upgrade and rebranded as the Discovery Palawan. 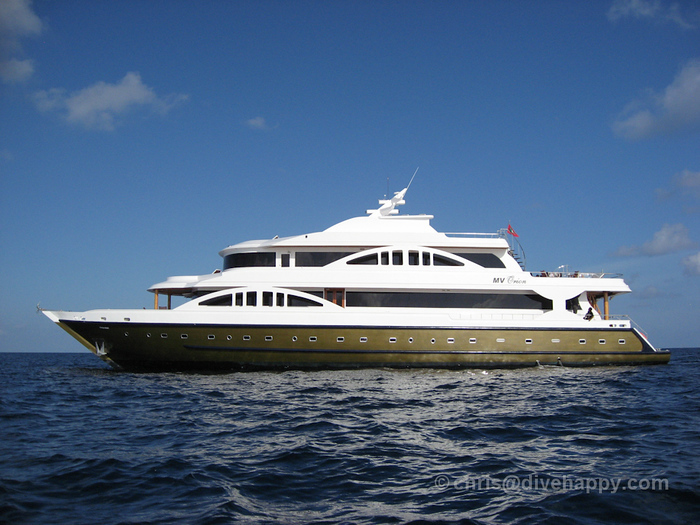 I’ll be on the Discovery Palawan in May 2013. You can read my forthcoming liveaboard report about the Discovery Palawan in June 2013 – please sign up for the Divehappy mailing list (see right) if you’d like to know when the Discovery Palawan liveaboard report is published. In June 2011 I visited Tubbataha Reef, Calusa and Cagayancillo on a transition trip from Puerto Princesa to Cebu on the Hans Christian Andersen Philippines liveaboard, I’ve written up a report about Tubbataha diving separately – this report focuses on the liveaboard boat itself. The Hans Christian Andersen spends March to June diving Tubbataha, then crosses to Cebu to dive the Visayas during July to November, and then returns to Palawan to dive the wrecks of Coron and the surrounding area during December to March. Follow the links for my previous diving reports on each area. 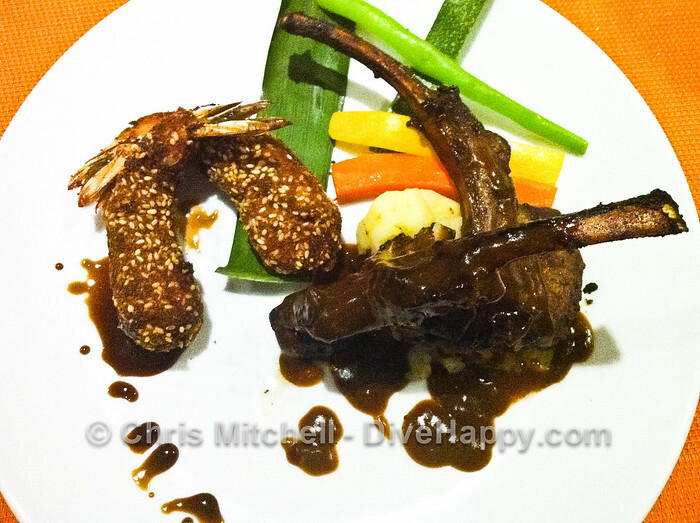 (You might also find my Best Diving In The Philippines overview useful). 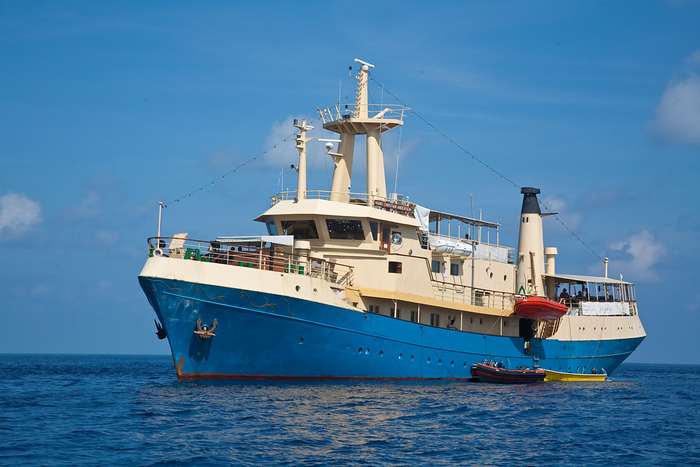 Essentially the Hans Christian Andersen is a large steel boat that’s been repurposed from its original training vessel origins to become a liveaboard that can accommodate up to 34 divers. Such is the size of the boat that we had 28 on our trip and it still didn’t feel crowded – there are numerous cabins below decks and six on the upper deck along with a saloon and then a very large outdoor dining area upstairs where all meals are served. In future the number of divers might be reduced to 24 maximum – check before booking. Given it’s not been purpose built, the ship feels quite quirky but also very solid and reliable. The saloon bar which is fully inside the ship is split between two rooms and has groovy 70s green leather seating and stained glass, while the upstairs outdoor eating area feels very pleasant, even when it’s raining due to rolled down plastic see-through covers (although it could do with a bit more protection to stop raining coming in at lower leg level. We had a downpour at one point and the chairs and tables got quite wet). Moving around the ship takes a bit of getting used to – there are steep staircases up and down from the upper deck where meals are served and dive gearing up takes place, There’s also a big step over for the main door into the saloon, and then two more steep staircases going up or down to the upper and lower cabins. I had an air conditioned upper deck cabin with double bed which was spacious and with a good sized ensuite shower and toilet, as well as a decent sized window. The water pressure for the shower is good, but the water never gets super hot – pleasantly warm is about it. The aircon works quite well – not super cold but adequate, from a fairly ancient looking but reliable unit. Sometimes it felt a little stuffy as if the aircon was struggling to beat the heat outside, but this was just on a couple of occasions. There’s a small desk and stool as well if you want to sit at a table to work, and a cupboard for storing clothes. In all, the cabin was very pleasant and definitely felt like a little sanctuary to catch some sleep between dives or work on photos. Food was uniformly excellent – usually a meat dish, fish dish, pasta or rice and also a vegetable dish, with ice cream and or fresh fruit for dessert. (Breakfast always had eggs and sausage or meat of some kind available along with fruit juice). Generous helpings and second helpings usually available too. The food is served buffet style and the staff were very attentive about dishing it up and also clearing away plates and refilling water etc. There’s also tea and coffee always available. At night after everyone has gone to bed there is usually bread or cookies and always fruit in the saloon for late night snackers, although some of the staff sleep in the saloon so you need to tread quietly. There are four chase boats on the Hans Christian Andersen, three being used to send out divers and the fourth as a backup. They are carried on deck when not in use so each morning they’re lowered into the water by hydraulic cranes. The engines are a bit elderly on the boats and could do with being beefed up. The boat boys are very helpful at getting you in and out of the water and understand how to handle camera gear. They can be a bit trigger happy with the engine when coming in to pick up divers on occasion. Everyone’s dive gear is stored upstairs on the main mess deck near to the eating area. 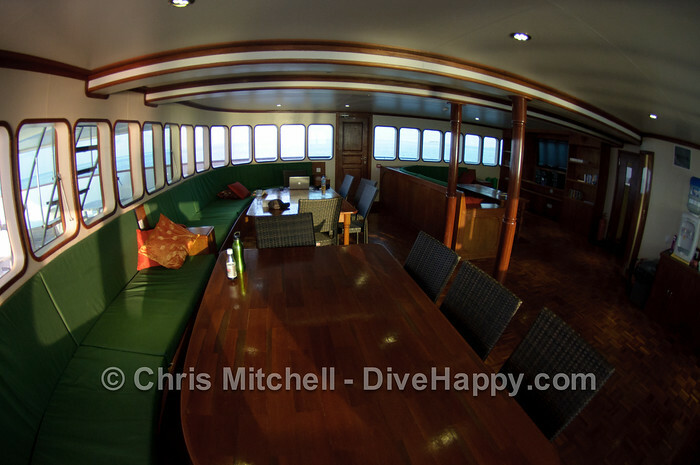 Guests don wetsuits and masks and then go downstairs to the quite small main deck and get into the chase boat where their bcd and reg is already setup and their fins are waiting. At first this felt a bit weird but it works very efficiently and its great having so much space for everyone to change in and out of their dive gear on the upper deck. Care has be taken going up and down the stairs however as they are steep. Gearing up on the boat is a bit of a struggle, especially as care has to be taken to keep the boat balanced. The crew help you don your tank and it falls into an easy routine quickly. Dive times are usually 60 minutes – each group has a guide but can wander off a little with their buddy. Our guide Omer was excellent, but he was a freelance guide from Puerto Princesa rather than full time on the boat. Camera gear is very well provided for on the Hans Christian Andersen which was a nice surprise. There are large rinse tanks on the main dive deck where cameras can be placed as soon as boats return. Several small tables in the saloon are reserved for cameras to be left out and also there’s a large battery charging area too. The boat boys, as previously mentioned, are very good at handling camera gear and remembering to remove dust caps etc. Hans Christian Andersen is not a luxury, purpose built dive boat, but it’s certainly a good contender for a comfortable few days diving. 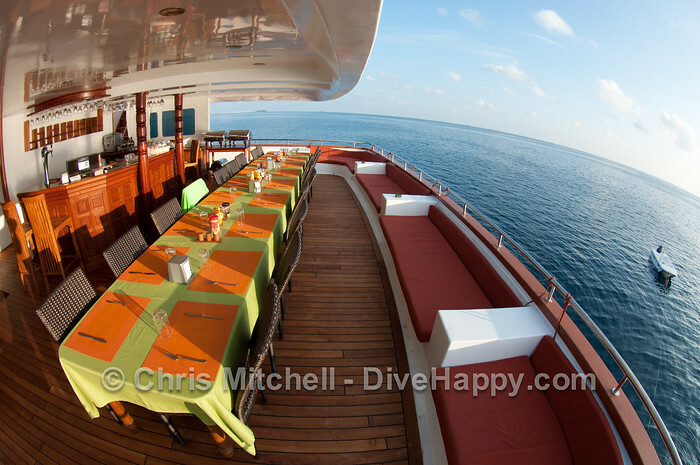 Once you get past the quirks of how things are set up to work around the ship’s design, the boat functions reasonably well and the generous, well-prepared food at mealtimes and general friendliness and helpfulness of the staff make it a very pleasant boat to hang out on between dives too. 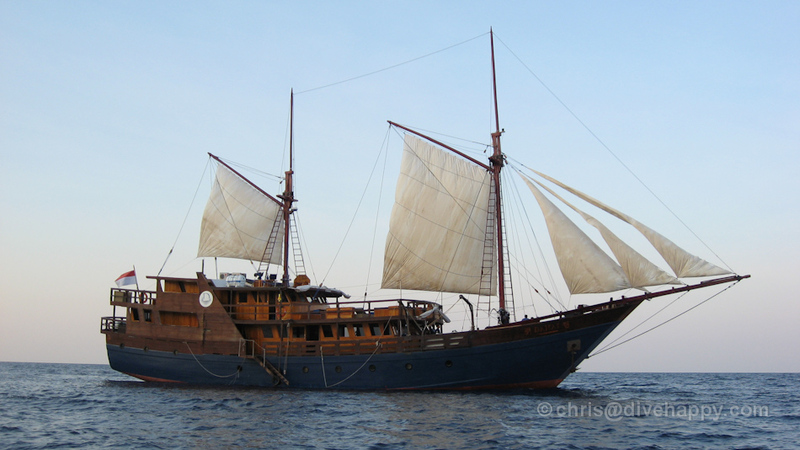 Tambora was initially recommended to me by my friend Dom, who runs the large liveaboard agency DiveAdvice.com. 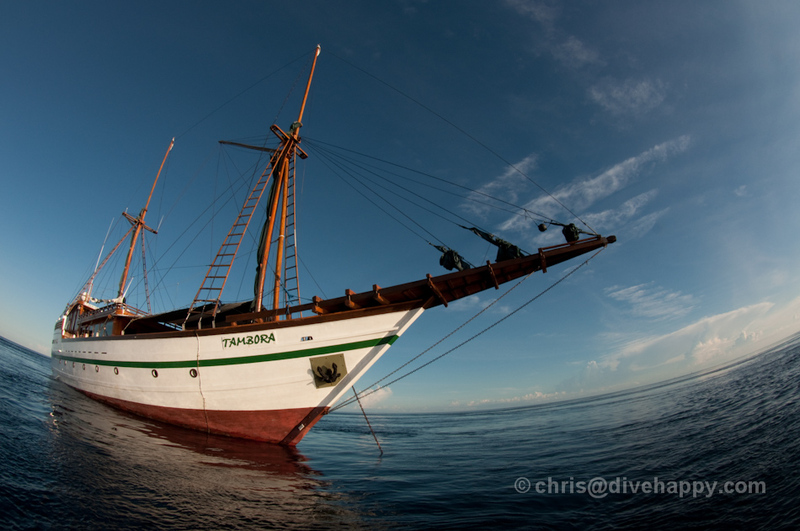 I needed to dive Indonesian Borneo (Kalimantan) and Tambora is one of the only boats to currently explore that area. I travelled with Tambora on a 10 day trip at the end of May 2010. Tambora is co-owned and managed by Uwe Gunther, a German former scientist who has been in Indonesia since 1998 and currently lives on the boat permanently. He is passionate about diving in Indonesia and is interested in exploring as many areas as possible, rather than just sticking to the tried and trusted favourites of Komodo, Raja Ampat etc. Uwe also answers all email correspondence for bookings etc sent direct the boat personally, which is a nice personal touch. Tambora itself is a brand new wooden pinisi schooner built in the shipyards of Sulawesi where most of these ships come from. Tambora has been built with scuba diving specifically in mind, rather than being converted from previous use. The boat began operations in 2010. Tambora can take a maximum of 16 guests in 8 cabins. The cabins are a good size with a nice dark wooden finish. Very pleasant to relax in. They are ensuite with a shower, toilet and sink with mirror. The shower is reliably hot and quite powerful. There is also a wardrobe and a desk and chair, perfect for photo editing. There are several well -placed plug sockets in the room. All cabins are basically the same – there’s no state room etc – and they are all located on the lower deck. 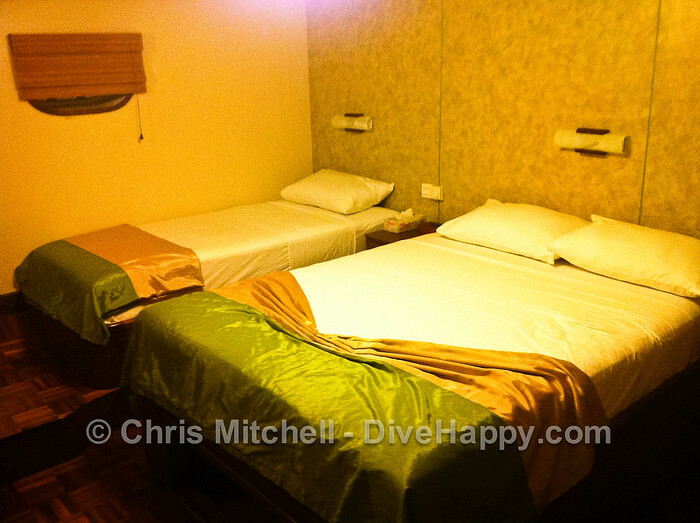 Besides double bed cabins, there are also twin bed cabins which are the same layout but have the two single beds end to end (rather than as bunk beds). Cabins are generally quiet but there were mysterious banging sounds on a couple of nights from below decks which did not help sleep. The photos below show the double bed cabin, and the video gives a quick tour of a cabin. Tambora has a big roomy dining area with lounge seating – very pleasant. 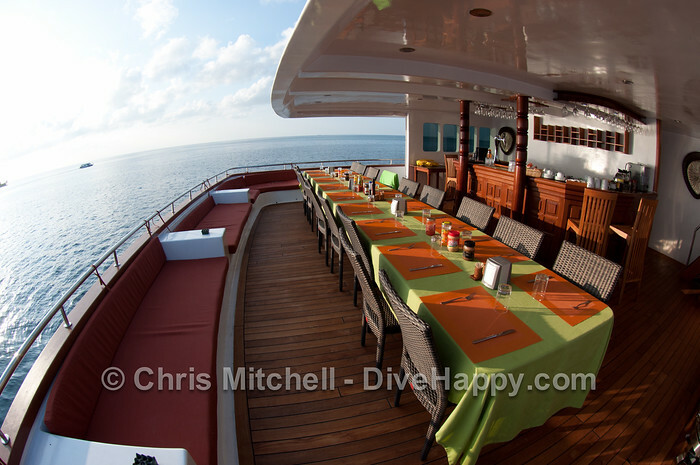 Because the gear area is at the back of the boat, the front area normally used for gearing up on pinisi schooners is a covered sun deck with loungers and tables, with a second sundeck on top of the dining area. This gives the boat a real sense of space – perfect for sundowners and early mornings. Smoking is permitted on both deck areas. Breakfast is cooked to order – eggs, bacon, sausage, toast etc. Cereal and fruits also available. Buffet style lunch, mix of Indonesian and Western food. Generally very tasty – ask for seconds if you want more. Desserts quite basic. There’s no choice re the menu but alternatives can no doubt be produced. Plastic plates and cups. The chef is a experienced sushi chef and produces an incredible sushi feast at the end of the trip (which somehow I failed to take a photo of – too busy eating I think). There’s coffee, tea and water available 24 hours, and buscuits in the jar. Soft drinks, beer and wine are also available. (Beer – $5 for large Bintang bottle, $3 for small. Wine is expensive – $30+ because of outrageous import taxes in Indonesia. If you’re fond of wine, might be best to bring your own). Dedicated room at the back of the boat for gearing up and storage of all equipment, which is a nice touch. Everything feels very efficient and organised – no chance of misplacing your gear. This is directly by the entry onto the speedboats. It’s a quite small area, difficult for more than 6 people to be in at a time. The camera room is located at the back of the boat by the gear up area and compressors. It has room for about 3 to 4 people at once maximum. There are no power strips for multiple plugs and there are no adapters available on board if you forget yours. There is no fan in the room to keep it cool – on the first day of gear setup I was soaked with sweat. There’s a large rinse tank by the camera room – so big it’s difficult to keep it at a depth to cover the camera gear. There were two RIB inflatables when I was on Tambora, but I’m told there’s now a third. Tanks with scuba gear are laid on the RIB floor by the boat boys and then donned at dive site. Integrated weights are removed at end of every dive and need to be replaced before each dive. Could be difficult/hard work for older guests. Back roll entry. Feels crowded and cramped on the boat – three staff and three guests. (As you can tell, I’m not a fan of inflatables). The boat boys are very good at handling cameras on and off the boat. However, one major problem is that there is little room to place large camera rigs and the boat boys often have to hang onto them whilst perched on the front of the boat. This is potentially quite a dangerous setup as the camera could get knocked off into the water. There needs to be some dedicated space for cameras where they are safe on the floor and away from scuba gear being pulled in and out of the boat. The boat drivers can be a bit trigger happy with the engines on dive sites when picking up and dropping off. Divers need to be aware of where the boat is at all times when near the surface. Excellent. Efficient organisation, good thorough briefings, lots of stuff pointed out. Dive guides are currently Fiona and Eddie, a British couple, and on our trip we were also joined by Mike, Indonesian guide who knew the Kalimantan area inside out. I had a very enjoyable 10 days on Tambora, and would certainly go back again. The important basics of comfortable sleeping, good food, hot showers and space to relax were well covered. Everything ran like clockwork. The diving setup was also efficient, despite my dislike of inflatables, and the guides were good. My only suggestion for improvement is that a bit more attention needs to be given to the camera room and to finding space to safely stow camera gear on the inflatables. It was particularly nice having Uwe on board – it gives the boat a more personal touch when you get to meet the owner. His enthusiasm for diving in Indonesia is infectious and he has lots of plans to keeping improving Tambora – but the boat has certainly started off with very high standards. You can see some of the photos I took during the trip on my page Scuba Diving in Indonesian Borneo. If you have any comments or observations about being on the Tambora yourself, please leave them below. It would be good to have several different opinions of the liveaboard, not just mine. I recently went to the Maldives to see the newly built MV Orion in its second week of operation. The boat already has an impressive setup, and with its final improvements due to be complete by the end of October 2009 (free Nitrox, free unlimited drinking water, personal entertainment systems in each room) it will be even better. The following is a rundown of the practicalities of being on the MV Orion. 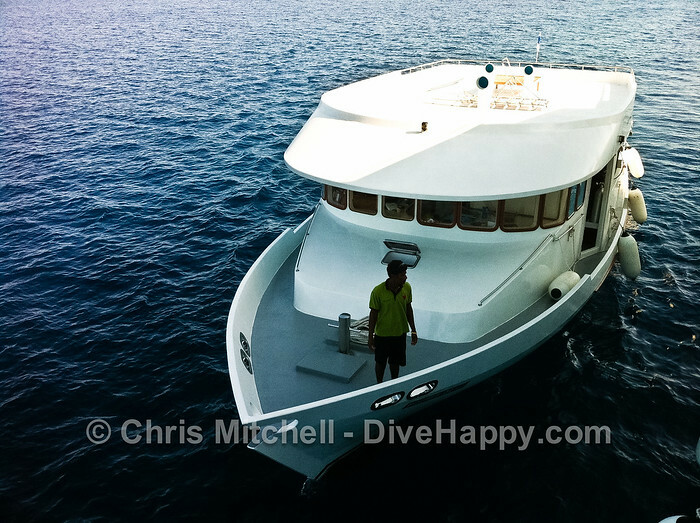 I’ve also published a separate trip report about the scuba diving on MV Orion – the boat follows a 7 day schedule around Male, Baa and Ari atolls. Included below are some of my world famous quick videos shot around the boat – there’s zero production values as it’s just me wandering around with my Canon IXUS. However, they hopefully give a good idea of what the bedrooms and bathrooms really look like. The first video shows the boat exterior, while the second and third show the Junior Suite and Standard Double Room. There is also a collection of photos below showing the outdoor bar area, the Executive Suite jacuzzi at the front of the boat, and the huge sundeck up top. 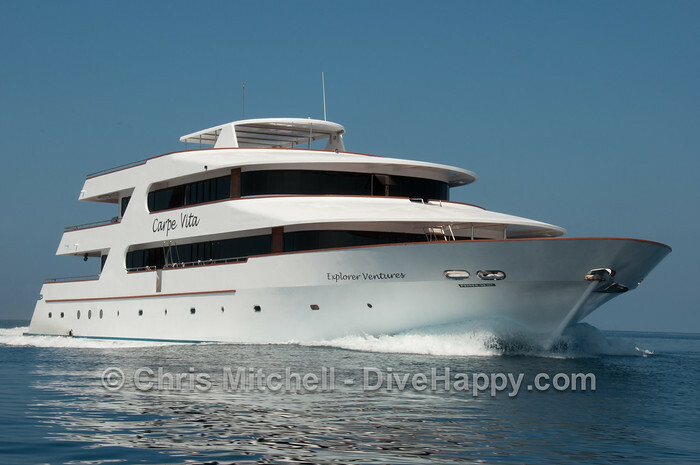 MV Orion is built around the cruising in comfort concept, where the boat is appealing to divers and non divers alike. Scuba is a big part of the boat’s itinerary with three dives a day — four if there’s a night dive – but it’s also a great boat on which to relax, sunbathe, enjoy the spa, sauna and jacuzzi and watch the Maldives seascape go by as the boat cruises during the day. Cabins are very spacious and well-appointed, while the dining room, bar area and sundeck are also designed to provide plenty of room. MV Orion can accommodate up to 22 guests. It has an Executive Suite, Junior Suite and several double rooms. All rooms are ensuite with hot power shower, spacious and well-appointed. 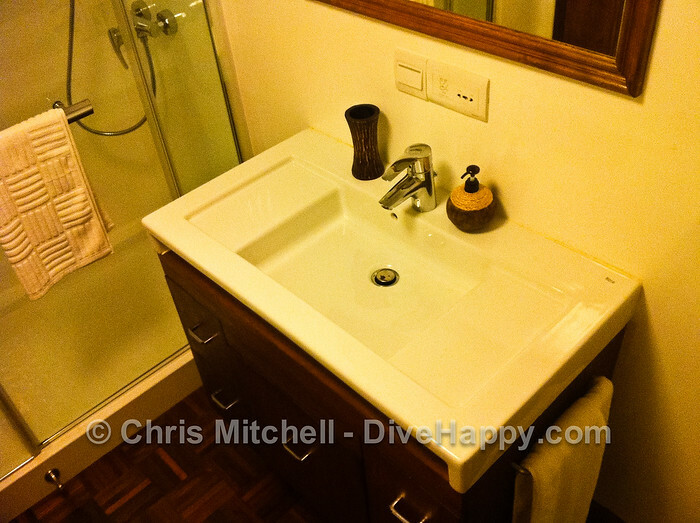 There is a vanity unit in each room which is good for setting up a laptop and camera gear if required. Each room also has its own flatscreen TV and will apparently have a personal media player in the near future. The air con was a bit hit and miss during our trip, but this is apparently being ironed out in the near future. MV Orion has a very large, comfortable air conditioned dining room where pre-dive breakfast, big breakfast, lunch, 5pm snack and dinner are served. Meals are served buffet style and there is always a choice of 3 or 4 different dishes. Fresh fruit e.g. watermelon or papaya is the standard dessert. Tea and coffee is available free all day. There is a water machine due to be installed on the boat which will provide unlimited free drinking water to all guests during their trip. Some boats charge for bottled water beyond an initial two litre per day allowance. There is a full bar on board serving beer and spirits – draught Heineken is around $4 a glass, and spirits around $5 a shot. 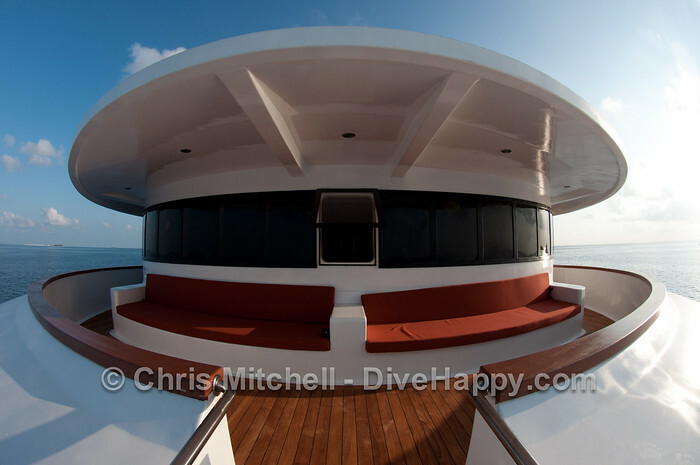 The sundeck on MV Orion is massive, with a covered area for those who want some shade. There is also an outdoor bar at the back of the boat which is perfect for sundowners. There is a jacuzzi located in the outdoor bar too, as well as a private jacuzzi at the front of the boat for the use of guests who are in the Executive Suite. There is a spa and sauna also located near the outside bar, and a Thai massage service is available on board too. MV Orion does not stick to a rigid schedule of trying to fit in a maximum number of dives per day. Three dives a day is the norm. Daily Dive Routine – most days begin early at 6am for 6.30 am dive briefing. All dives are conducted from a smaller boat, known as a dhoni, which follows the MV Orion. 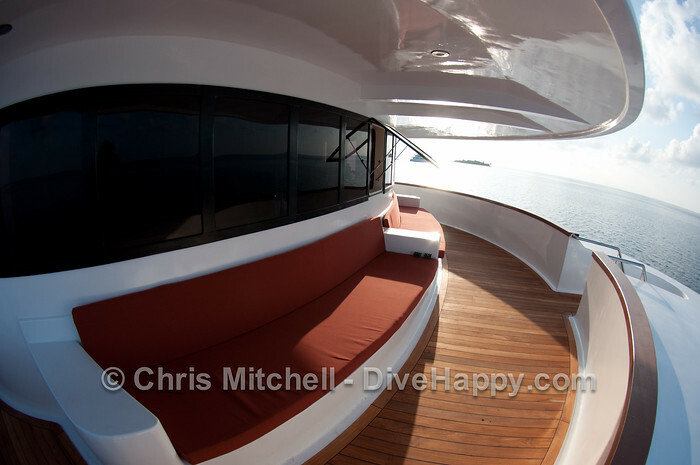 The dhoni has a fair bit of room for gearing up and storage boxes underneath each seat. All dive gear can be left on the dhoni between dives. Most sites are no more than 10 to 15 minutes from the MV Orion. Remember to bring water, sunblock and sunglasses for each dive. A towel is provided for each guest in their room to bring on the dhoni. Because all diving in the Maldives is tidal, guests should be aware that briefings can change while on the dhoni if the current is not behaving as expected. The dive guide will check the current before guests enter the water. Entry into the water is by giant stride, with a fairly tall ladder to climb back up at the end of the dive. Stepping onto the dhoni from the Orion can be a little bit tricky, so take care to watch your footing and let the staff help you. Dive guides – there are two dive guides, Hassan and Alex. They are the co-directors of MV Orion’s business. Hassan is a veteran Maldivian divemaster with over 15000 dives. Alex also runs a large dive operation in Singapore. There will a third Cruise Director joining the boat in November 2009 who will also act as a guide. Free Nitrox – Nitrox will be provided as standard on MV Orion. It wasn’t available when I was on the boat as it was only the second week of operation – send an enquiry using the form below to check if it’s available for your preferred dates. 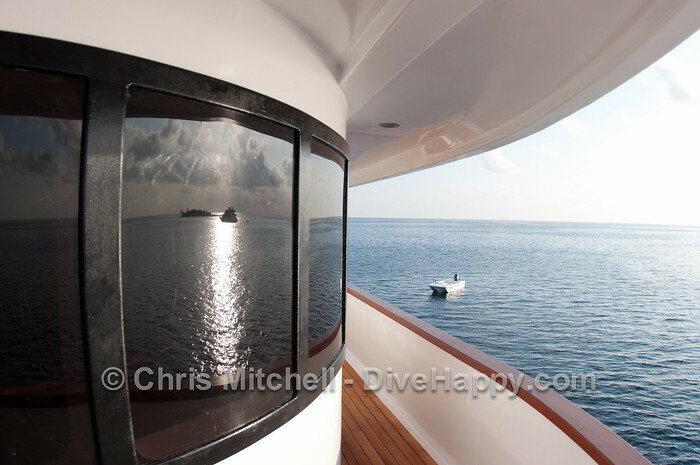 Camera Gear – there is a large flat platform on the dhoni which is a good place for putting cameras – a rinse tank is also available on the boat. There are charging stations for cameras in the dining room, but they are only really suitable for smaller cameras as they are cubby holes built into sideboard areas. There are several plug outlets in each room. The plugs use 3 pin British style plug sockets. Bring an adapter and surge protector if you use other types of plugs. The electricity voltage is 230 Volts AC / 50 Hz. Fly into Male Airport (the Maldives’ capital city) for pickup and transfer by speedboat direct to MV Orion. The ride takes about 10 minutes. Find the cheapest flights to Male on Skyscanner.